People are seeking experiences today! Hopefully this notion is not new to anyone and you have heard about the pervasive desire of humans today to invest more time in experiences than things. And, this is true for each of us at home, at work and, probably most pronounced when we are making travel decisions. Helping identify, develop and curate experiences is one of our organization’s top priorities in 2018. As noted in my November message, focusing on visitor experiences is one of the most important strategies defined in our Destination Visioning work. To jumpstart this work, we began an investment in 2017 by retaining Joe Veneto of Opportunities Unlimited, a star in the area of designing memorable and “immersive” visitor experiences. Other interesting cities like Columbus, Baltimore and Minneapolis have gained fantastic exposure and expanded visitation based on their work with Joe. We conducted a partner event with over 75 Greater Madison Convention and Visitors Bureau partners at Madison Circus Space recently. Joe was the feature of the program and inspired dozens of our partners to think of ways they can create experiences that will both attract—and extend—traveler visits. We are about to close our first round of applications to be the first Madison area attractions that will be engaged directly with Joe and build what we believe will be fantastic new visitor experiences. Concurrently with this work, we are about to embark on our second round of “Destination Training” modules with Madison College. As part of their fantastic industry training program, we have designed a module that trains participants in how best to present destination information and details to guests. Those that participated in our first module in late 2017 raved about the content and opportunity we created. 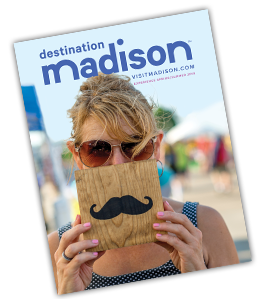 Launching our Visitor Experience and Destination Training work is only the tip of the iceberg in terms of fresh new ways we are striving to responsibly grow tourism for Madison and Dane County. As we begin 2018, we are excited to share this news and also to again applaud and celebrate the incredible news of the Air Force choosing Truax and Madison as the site for their next generation F-35s and the recent announcement of non-stop airservice to San Francisco. We have been engaged in the work to attract the F-35s and have been longtime supporters of the work Dane County and Dane County Regional Airport management have pursued to expand air service. So much good news to share…and, it’s only January! As they say, it should be a great year! What knowledge or feeling do you hope someone walks away with after visiting the Heritage Center for the first time? It is hoped our visitors come away with an appreciation of the stories and the sacrifices made by these Norwegians as they left their homeland for a new life in America. In the early years, they worked hard to establish new homesteads, farms, churches, schools and businesses. 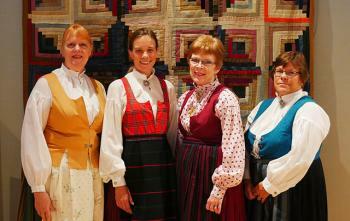 Why is Stoughton’s Norwegian history so important to the city and the Livsreise? Our historic downtown has been preserved largely intact as the city grows and prospers. Our Main Street is a tribute to these hearty Norwegians. It was important to locate Livsreise on Main Street to further promote Norwegian heritage and culture. Stoughton is also known for having the largest Syttende Mai (17th of May) celebration outside of Norway, honoring its Constitution Day. Whether you are Norwegian or not, everyone pitches in to make it a successful festival. What would people find to be the most unexpected element of your business? We are more than just a museum. In addition to a great number of artifacts on display, we have many state-of-the-art interactive kiosks. These displays draw in the visitor to touch the screen and learn more about the immigration experience. Our electronic story books include personal accounts of early immigrants to Stoughton and surrounding communities. What is the best compliment or review you’ve received from a visitor? Any exhibits that you would like to highlight that are coming in 2018? There are always changes being made to both our story books and culture kiosks which will continue into 2018. Throughout the year, we use our 68-seat auditorium to host experts speaking about Norwegian immigration and history, genealogy and traditional arts such as weaving, carving, knitting and fiddle making, to name a few. For 2018, we have invited a direct descendant of the first group of Quakers who came from Norway to America in 1825 to speak. He will talk about their journey across the Atlantic on a small sloop and the new settlement they started in Illinois. We welcome groups of all ages and sizes, especially school groups. Teachers should know that we have study guides and immigration videos available for a couple of different grade levels. We are proud of our knowledgeable and dedicated volunteers who work along with our staff to provide a wonderful experience for all who visit! Livsreise is located at 277 W. Main Street in Stoughton and is open Tuesday through Saturday, 9:30 a.m.–4:30 p.m.